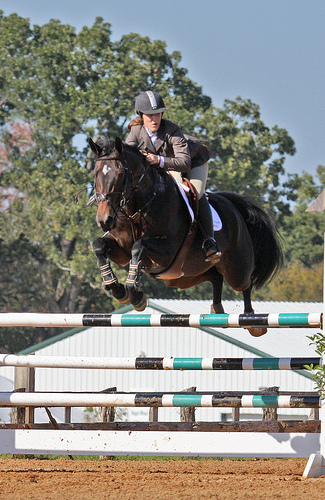 There is nothing quite like the feeling of jumping a really good jump off. I always want to be the horse and rider combination that jumps a good time, consistently using good technique, with a happy confident horse. I don’t want to be the person galloping round and thinking I’m lucky I made it. It’s not sustainable and it’s not possible over larger courses. So what does it take to jump a good jump off? Look for the shortest lines that are reasonable for you to take. Remember that you should consider how supple your horse is and how experienced both you and your horse are. If you aren’t able to angle a fence then don’t. Practice at home first. Remember to cross the start and finish lines as close to line or the jump as possible. This may mean that you alter the most obvious line to the jump. Remember that shorter lines and clear rounds win. Don’t go faster and longer on an ordinary track. You risk lengthening your stride and flattening into fences. A stronger stride into a fence also makes it more difficult to make a tight turn afterwards. Make sure that you are keeping your horses hocks underneath him or her and that you are riding your horse forward into your hands. This is especially important through your corners! Keep your body as still as possible over the fence. Keep a supple hip let your horse determine the amount of forward bend you need. This will help your horse lift through the shoulder and lessen the chance of a knock in front. It will also allow you a quicker recovery for a quick turn. Look in the direction you are going to turn when you are going over the jump. This will help you land on the correct leading leg. Plan your jump off course in advance. Go through it in your head time and time again. When you get into the ring you shouldn’t think – you should just do. (See our blog on using visualisation for improving performance). Good luck – jump and enjoy.